When the first sarsen stone was raised in the circle of Stonehenge, the land we call England was already very ancient. 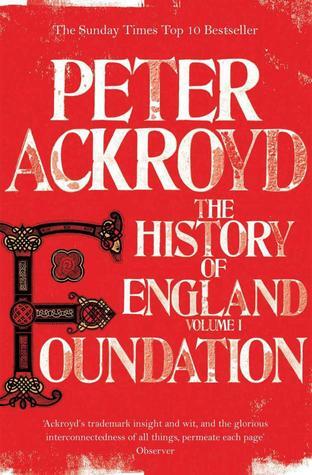 Foundation is the first volume in Peter Ackroyd’s series of the history of England. It spans the time from the Neolithic Age to Henry VII, the first Tudor king. This book covers a huge span of history. It encompasses the Iron Age, the Roman Rule, the Anglo-Saxon invasion, the Vikings, Medieval England and the Wars of the Roses. So sadly, there were quite a few chapters that I felt didn’t get the attention they would have deserved. For instance, the Roman Age is dealt with in little over a chapter. Now, that is understandable given the scope of the book, but I feel like it would have been better to split the book in two, since the way it is now, it focusses mostly on medieval England. Nonetheless, the book provides an excellent overview of the time. You can really see the historical continuities and how some events bear strange fruit years later. Peter Ackroyd also takes care to always refer back to the past, showing how certain things have their roots in the Neolithic for instance. Sometimes, that is really fascinating, but at other times, it feels a bit off. For instance, when he repeats for the tenth time that the villages of a certain time have their root in Neolithic and Anglo-Saxon villages. It rips you out of the time you were reading about. Villages were in existence in the period of Roman dominance, and similar settlements could be found in the Iron Age. Continuity once more is key. Where the book really excels is the little details, the oddities of history. Things happened that would seem more at home in a novel. On one occasion, she retreated from the castle at Devizes in the guise of a corpse; she was wrapped in linen cerecloth, and tied by ropes to a bier. Subsequently she was besieged in the castle at Oxford on a winter’s night; she dressed in white, and was thus camouflaged against the snow as she made her way down the frozen Thames to Wallingford. The language of the book is also very lyrical and often reads as if someone is telling you a story. It doesn’t always fit. Particularly in the first chapters the little remarks thrown into the narrative were incredibly annoying. There is evidence of steps leading from the street, and of small windows on a level with the ground. The life of the past leaves other marks on the earth. A worn floor will trace the path of a door once swinging to and fro. Go in. Thankfully, they get rarer the more the book progresses. An excellent overview of English history from its beginning to the Tudors.